Implant removal is a need particularly when it is applied in a tendon rich area. Department of Orthopedics, Murshidabad Medical College, PO – Berhampore, District –Murshidabad,, West Bengal Pin – 742101. India. F – 505, Maitri apartment, 255, N S C Bose Road, Kolkata – 700047. India. Introduction: Introduction: Spontaneous ruptures of extension pollicis longus tendon predominantly occur after undisplaced or minimally displaced distal radial fracture near Lister tubercle. 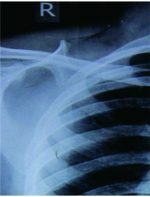 Systemic inflammatory diseases and systemic or local steroid, mechanical causes like bony ridges, presence of bone plate or external fixator pin may precipitate this. Repetitive uses in certain occupation like cooking, cow milking, tailoring and direct trauma in kick boxer are also identified as cause. 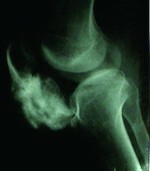 In this study it is caused by screw tip that also after 20 years. Instead of tendon transfer, interposition tendon grafting is preferred. 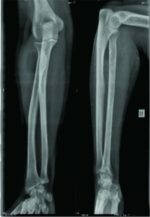 Case Presentation: 36-year-male manual worker was plated for distal radial shaft fracture of left side. Distal most screw length was 3 mm in excess. After 20 years he developed rupture of extensor pollicislongus spontaneously. After excluding probable other causes and confirming by USG tendon ends were explored through dorsal incision. Offending slotted head screw was removed using hollow mill. Ipsilateral Palmaris longus tendon was grafted. Tension was set by extension of thumb and neutral position of the wrist. Removal of stitch after 2 weeks, short arm cast immobilization for 6 week and intermittent splinting and exercises for another 6 weeks yield excellent result. Conclusion: Timely removal of implant when it is applied over tendon rich areas is preferable. In late situation surgeon should be equipped and careful to remove it. 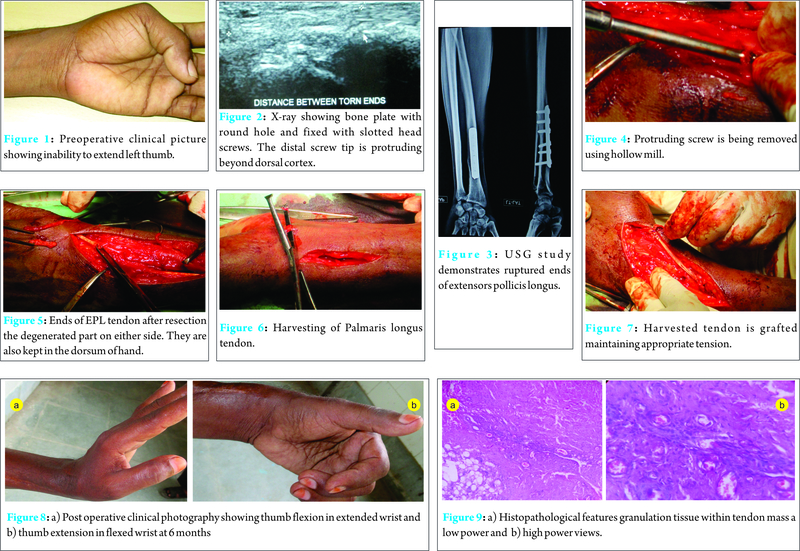 To avoid chance of transferring a diseased tendon interposition grafting using Palmaris longus is justified. Spontaneous rupture of extensor pollicislongus (EPL) is, though uncommon but well known entity, after fracture of distal radius . Systemic inflammatory diseases, systemic or local steroid users do suffers from the problem at lesser frequency . Mechanical causes like, presence of plate or external fixator, non union of scaphoid, sublaxation of ulnar head are also reported [2, 3]. Over use like cooking, cow milking or tailoring and direct trauma to the EPL tendon in kick boxer are also reported [2, 4 -6]. This case is being reported as attrition rupture due to chronic irritation of EPL by screw tip took place after 20 years of implantation. Justifications of Palmaris longus (PL) tendon grafting rather than tendon transposition are discussed. One thirty six year male manual worker presented to us in April, 2015 with spontaneous rupture of EPL of left side. 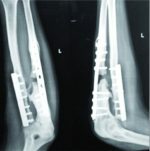 20 years back he underwent open reduction internal fixation for fracture of distal radial shaft with round hole bone plate and slotted head cortical screws. It was diagnosed clinically with persistent flexion and inability to extend the interphalangeal (IP) joint of the thumb [Fig. 1]. Painless mild swelling was found over distal forearm and wrist. Passive motions of all joints of hand and wrist were normal. He does not have any history of systemic disease or steroid use. Diagnosis was confirmed by ultra sonography [Fig. 2]. X ray showed bone plate with the distal most screw was of excess length beyond dorsal cortex likely to cause irritation of dorsal soft tissues [Fig. 3]. Rheumatoid factor, blood sugar level, uric acid, ESR, CRP and TSH were within normal limit. Removal of the offending screw, exploration of EPL, excision of its degenerated part and PL grafting were planned. With regional block and under tourniquet one 15 cm long dorsal incision was made from base of the thumb to the Lister tubercle and extended proximally. Screw tip was identified and it was detached from screw holding mass of bone using hollow mill upto the plate [Fig. 4]. A small incision was made over volar aspect to identify screw head after removing the over lying bone. Reciprocating screw driver for slotted head screw was used to remove it finally. Some amount of corrosion was observed around the tip but not over the remaining part of the screw. Ends of the EPL were identified, the degenerated parts were excised and sent for histopathological study [Fig. 5].Appropriate length of ipsilateral Palmaris longus was harvested and grafted between the ends of the EPL [Fig. 6]. Proximal stump was fixed using Pulvertaft’s technique and that of distal stump by modified Kessler’s technique [Fig. 7]. 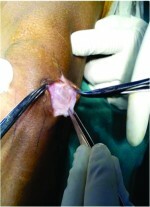 Tension of the graft was set by full extension of thumb in neutral position of the wrist. Third dorsal compartment retinaculam was sutured to reform pulley. Wounds were then closed and Plaster of Paris slab was applied in dorsiflexed wrist and thumb in extension and abduction. At two weeks stitches were removed and short arm thumb spica cast in neutral position of wrist which was removed after 6 weeks. Intermittent splinting and regular hand and wrist exercises were advised. Patient is regularly followed up at an interval of 3 months. The final result at 6 months shows full wrist movements with 20 degree restriction of thumb flexion [Fig. 8a) and 8b)]. Grip and pinch strengths are 90% of normal side. As per Mayo modified wrist score criteria result is excellent. Histopathology demonstrates features of granulation tissue [Fig. 9a) and 9b)]. Apart from direct injury timing of attrition rupture is not well defined in literature. As observed by Engkvist O et al. (1979) it is around two months after undisplaced or minimally displaced fracture distal radius near Lister tubercle and the incidence of EPL tendon rupture is 0.3 percent after distal radial fracture . In the present study rupture took place after 20 years. Most authors managed such situation by transposition of extensor indicis proprius (EIP) tendon [6-9]. It is less invasive procedure with predictable function of thumb and undisturbed function of the index figure. Muscle education is also easy. Infrequently tendon transfer of extensor digitiminimi or extensor digitorumcommunis for little finger and extensor carpi radialis longus are also used . Modified technique of EPI transfer as described by Zheng et al. (2012) is claimed to produce better result . Tendon repair is possible in acute rupture by direct trauma. Interposition tendon grafting using PL tendon is rare in literature . In preoperative planning of the present study it was decided to explore EPL as well as tendon of second and fourth dorsal compartment as the projecting tip of the screw was about 4 cm proximal to Lister tubercle where attenuation of other adjacent tendons including EIP is not unusual. More over offending screw removal is a need because it might cause damage subsequently. Practically it is impossible to remove a screw from cortical bone after 20 years particularly when it is of slotted head. So straight forward we made hole around the screw using hollow mill and removed it finally by slotted head screw driver from the volar side of the plate. Plate removal was not attempted as it may not be possible or might cause refracture of the radius. In present case we preferred interposition PL tendon grafting and reconstruction of pulley. Setting tension during graft interposition is a critical issue to obtain balance between flexion and extension of thumb. Standard tension is obtained by full extension of the thumb with 30 degree flexion of wrist. Whereas over tension is obtainable with full extension of thumb and wrist in neutral position. Jung et al. (2014) claimed better performance with over tension .We also followed this in this study. Though there is 30 degree restriction of thumb flexion the overall result is excellent. Timely removal of implant when it is applied over tendon rich areas is essential. In such late situation it can be done when surgeon is adequately equipped and careful. Interposition tendon graft is preferable to tendon transfer to avoid chance of diseased tendon transfer in some situation. 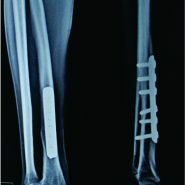 Appropriate size screws are to be selected particularly in tendon rich areas during fixation of fractures. Early removal in avardend situation is essential to avoid delayed rupture of tendon even at 20 years. 2. Chul Han Kim. Spontaneous Rupture of the Extensor PollicisLongus Tendon. Arch Plast Surg. 2012 Nov; 39(6): 680–682. 3. Harvey FJ, Harvey PM. Three rare causes of extensor tendon rupture. J Hand Surg Am. 1989;14:957–96. 6. Lloyd TW1, Tyler MP, Roberts AH. Spontaneous rupture of extensor pollicislongus tendon in a kick boxer.Br J Sports Med. 1998 Jun;32(2):178-9. 7. Engkvist O, Lundborg G. Rupture of the extensor pollicislongus tendon after fracture of the lower end of the radius: a clinical and microangiographic study. Hand. 1979;11:76–86. 9. Zheng X1, An H, Chen T, Wang H. Effectiveness of modified extensor indicisproprius tendon transfer for reconstruction of spontaneously ruptured extensor pollicislongus tendon. ZhongguoXiu Fu Chong JianWaiKeZaZhi. 2012 Sep;26(9):1074-6.